It began as a 'what if?' exercise after a few blokes saw some pics in a magazine. Now the Hillier hardtop is in production as a high-class, low volume 370kW Aussie supercar. What do you do if you can't buy what you want? That's an easy one to answer: you make it yourself. Brothers Clayton and Troy Hillier wanted a Ford Falcon two-door coupe. Problem was, Ford Australia hasn't made a two-door coupe version of its Falcon family sedan since the mid-1970s. You can guess the rest. That's the short story. The long story stretches back 20 years, to when Troy and Clay were liddle kiddies and their father, Gavin, decided to turn his collision repair experience in Tenterfield, NSW to building limousines and hearses. In time, the boys joined the business after training for several years as automotive body builders and, as most car nuts do, began playing with cars in their spare time. Racing Minis was a bit of fun during their teenage years, and into their 20s attention turned to building various modified cars - usually Pro- and Super-Street 1960s Ford Falcons - to attend the huge Summernats car festival in Canberra every year. At first, the modified cars were a hobby, something to do after hours, after the doors had been closed for the day on building highly regarded Ford Falcon-based hearses. But recently, the toys on the side have opened up a new opportunity for the Hillier coach building team - that of handcrafting two-door coupes. The car you see here is effectively the fourth Falcon two-door Hillier Hardtop created. 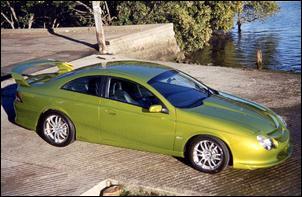 The first car was a six-cylinder ex-police Falcon Forte that was bought damaged and converted during 1999. 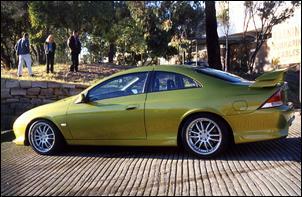 It was painted a subtle forest green and debuted at Summernats. Many people walked past the car, oblivious to the fact the car was a handcrafted two-door based on Ford's latest model. 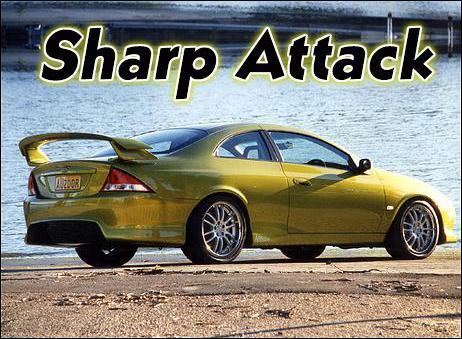 The second car was also an ex-police car, a high-performance XR8 V8 model, bought by Hillier staffer Mark Rovera and built into a stunning bright red Hardtop during 2000. The third car was, in fact, the first car. 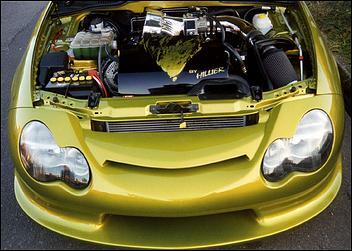 The Hilliers were approached to assist Advanced Engine Components (AEC) in building a wild concept car to showcase its engine management and component expertise. Through a gentleman's agreement with Ford Australia, it was also intended to drum up some performance credibility in the Falcon badge. "They wanted something to drop jaws," recalls Troy of the phone call from Advanced Engine Components. "You'll remember that was when Ford was getting kicked in the sales race and just getting back into V8Supercar racing. They wanted to drop in a 4.6-litre Mustang engine and really go nuts with it." So the first-ever Hillier hardtop was taken away and, with the help of several other Australian companies, including AEC and Millard Design, created the Falcon 300+, a bright red high-performance two-door coupe. 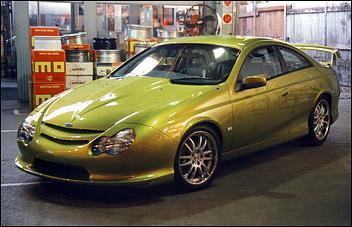 It was powered by a modified Ford V8 with a claimed 300kW (giving the car its name) and was debuted on the Ford Australia stand at the Melbourne Motor Show in early 2001. Although it created a lot of publicity for Ford Australia, it led to a lot of disappointment among hard-core Aussie Ford fans when the word came through that the 300+ was simply a show/concept car and not to be put into production. "A lot of people felt let down," agreed Troy. "This Falcon had been in all the papers and all the magazines and the rumour was that Ford was going to once again build a two-door coupe. We kinda knew from the beginning that wouldn't happen, that it was just an attention grabber." That was around the time, too, that Holden in Australia announced it would be building a two-door coupe - Monaro, a badge revived from the 1970s - based on the Commodore four-door family sedan platform. That further rubbed salt into the wounds of local Ford performance freaks: After a quarter-century absence, Holden fans were getting a tough two-door Monaro once again, but Ford fans were being denied the opportunity to park a new Ford two-door beside the Monaro in pub car parks. Camaro and Firebird loyalists in the US must have felt the same emotions when GM announced the end of these two models recently. "If that car (the 300+) had simply been built as a show car by Ford Australia, it would have ended there," said Troy. "They would have had to tool up for the new quarters and roof - Ford had no way of manufacturing them. They can't hand-build cars like we do. But people found out we had supplied the modified shell to Ford and that in fact we were able to hand-build these things." What you see here is effectively the fourth car. It's been built to show just how far a customer could go if he wandered into the Hillier's northern NSW showroom and said I Want One With The Lot, Thanks. Built from a brand-new car, the Arrow - as this one has been christened - is one of the most outstanding cars built in Australia in the past few years. Built with the assistance of Roman AutoTek, the Australian Recaro distributors and running around 370kW from a stroked 5.8-litre based Windsor V8, it blurs the line between showroom and show. The Arrow was built from brand-new AUII series Falcon. Unlike the previous cars that looked 'factory' with standard-looking front and rear styling, the Hilliers wanted to get maximum impact with this one. Every panel on the car has been modified in some way (except the luggage compartment lid, that carries a monstrous rear wing). Of course, a conventional Hillier two-door conversion involves doors, roof, A, B and C pillar work and quarter panels but the Arrow adds plenty more to the build list. The bonnet has been enhanced with a centre section raised in the shape of an arrow. It's there for two reasons - style and substance. As well looking tougher, the engine underneath required some extra room. But more of that later. The rear quarters and sills of the Arrow have been pumped out to match the wider rear wheels and track, with the doors given a corresponding caress. Falcons usually carry side protection bump-strips that sit against a crease along the side of the car. The Arrow is devoid of this factory feature, requiring the front guards to be de-creased behind the wheelhouses to match the hand-made door skins and quarter panels. 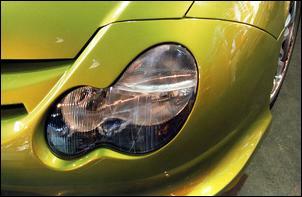 The head lights are described by the Hilliers as European Bosch units - uh huh - and are mounted in a unique nose panel built in-house. The rear bumper, too, is also a unique Hillier-styled item. Both front and rear units will be available to customers if they choose. Another style change the team incorporated for this car was to 'kick up' the window sash line to give the car a more angular, wedge profile. The laminated glass is supplied by the same trusted company that supplies the Hilliers with all their limousine and hearse glass. Other items such as door rubbers and trim strips and internal trim components are either sourced from Ford OE suppliers or manufactured by the Hilliers. Twenty years of sourcing these components (such as lengthened window rubbers) for hearses has given the Hilliers the knowledge of exactly where to look for unique components. And what they can't find, they make. Usually, there's around 10 weeks work in building one of these Hardtops from go to whoa, but this one thanks to its extensive modifications, took considerably longer. Under the bonnet Aussie Falcons have the US-built Mustang 5.0 EFI Windsor V8 (yeah, the old one!) as an option, but the Hilliers thought they'd go one better and slot in a 5.8. And not just any old 351- it had to back up the performance boast of that body. Clayton built the engine based on components from Race Parts Australia in Queensland. The block is a 5.8, with the taller deck than the 5.0 unit, and the crank is a Ford Motorsport SVO stroker, on Clevite bearings, to take the capacity out to around 6.4 litres (392ci). The block remains two bolt main caps but uses studs rather than the stock bolts. 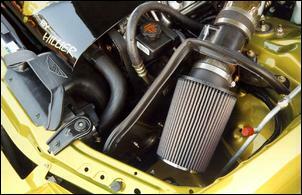 The sump is modified with baffles to reduce oil surge. Pistons are forged on steel rods with ARP bolts. The heads are alloy Edelbrock Victor Jnr and the intake is a tall, large-runner Edelbrock Victor air-gap item (hence the need for the modified bonnet - the manifold sits quite high) and the cam is a reasonably wild SVO item spun by a double-row timing chain, too. 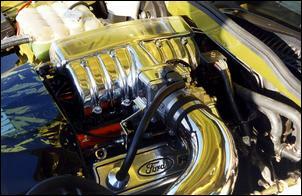 Throttle body is a big-breathing 75mm Edelbrock and the MAF is a big Mustang/Tickford 250 bit. Injectors are Ford Motorsport and the fuel pump is a big Bosch. Management is EECV, aided and abetted by a UniChip, fitted and tuned by Ford expert Bob Romano Motors in Brisbane. "He put it on the dyno and took it for a drive and said - yeah, that's it," says Clayton. "It's a bit rich up top, but we'll have more of a play when it's run-in." With a non-OE engine in the Falcon bay, the exhaust system had to be extensively modified from a set of standard Pacemakers. They're cut at the flange and fitted closer to the block. "We had to do a bit of fiddling on the driver's side to get it around the steering," Clayton recalled. "There was a bit of mucking around." It breathes through two high-flowing cats and a single muffler, in front of the diff, built by Lambros/Hi-Tech Exhausts in Sydney. The radiator is an ARE unit that works, "unreal. The needle just doesn't move! Cost us a grand, but. There's also an oil cooler in front of it." "If you want to drop the exhaust and pull the limiter off it, it'd go to 7, I reckon," says Clayton. "It'd make close to 550 (horsepower). It really needs a bigger exhaust - twin threes - but it's a road car." Behind the big Windsor is a steel flywheel and a version 012 Tremec T56 manual gearbox. There are several versions of this six-speed gearbox and the 022 version is used in Holden and HSVs in Australia. The 012 uses different ratios and is fitted in Mustangs in the US. Undertaking the non-standard installation was well-regarded gearbox specialist Mal Wood of Mal Wood Automotive in Warwick, Qld a couple of hours drive from the Hillier's hometown. "It's like the Commodore box, but the Mustang uses a shorter gear set," relates Clayton. "The Commodore one is geared too high. This one gets shorter together the further up you go." Gearing is just under 2000rpm at 100km/h with the gearing and tyre combo. "It works well with the camshaft." Indeed it does. Troy coyly admits to recently seeing 5800 rpm in top gear - on paper, that's almost 300km/h. Other numbers are 0-100 in 5.8 seconds and the quarter in 13.7. 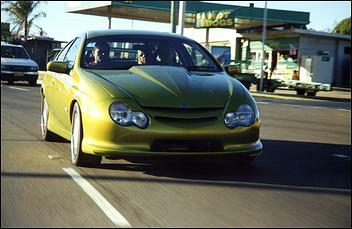 Mal Wood is also responsible for the installation of the Ford nine-inch based live rear axle. Although the Ford Falcon is available with an optional independent rear suspension, the Hilliers reluctantly chose to use a live axle under Arrow for its proven durability - the factory IRS diff centre may have been beyond its reliable limit with the output of the big Windsor. A secondary factor was the routing of the exhaust - an IRS with its sub frame, control arms and drive shafts leaves little room for a large exhaust necessary to drain a healthy V8. The tail shaft is a two-piece unit supplied by Hardy Spicer and uses a Ford F350 centre bearing. "We use a CV joint, like a Commodore one, in the hearses, but it wouldn't cop the power." With "way more than 300kW", testing has shown the use of the close-ratio Mustang gearset in the Tremec and super-low 4.1 diff gears actually hurts the Arrow's performance. Acceleration, although impressive, is several tenths off what the boys feel the car is capable of. And the theory is, with a monster motor delivering bags of torque, the gearing is too short. Not only is the engine not working for a living, but there's too many gear changes on the way to 100 kay. Brakes at both ends are enormous. They're Australian-made Harrops spanning 330mm front and rear, squeezed by shoe-box sized four-piston callipers. Harrop is the Brembo of Down Under, with a long history of supplying brake components to Australian motor sport and more recently for OE (HSV uses Harrop callipers on some of its models) and high-performance road cars. 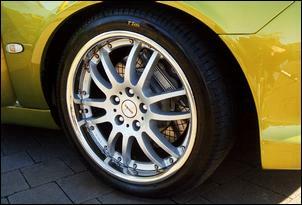 Suspension is a complete package from Fulcrum Suspension in Brisbane and both Troy and Clayton rate the package highly. "It's very direct and firm with no wallow," says Clayton. "It's very responsive - it goes where you point it." 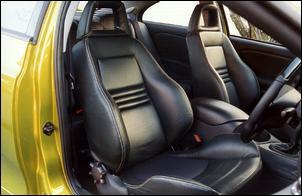 Roman AutoTek is responsible for the interior and the rolling stock. Roman AutoTek is the only factory-appointed Australian distributor for Recaro, Speedline and Momo high performance accessories. 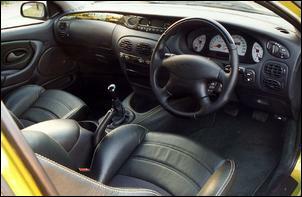 Although focussed on the aftermarket, AutoTek has a good relationship with the Australian motor industry, especially with Ford and Tickford, to whom it supplies OE Momo airbag steering wheels - and has been involved with designing, building and specifying many concept/show and limited-edition cars. The AutoTek involvement with the Hilliers came about when Bob Roman visited Summernats 14 (a huge annual car festival in the Australian capital of Canberra) and met the Hilliers and saw Mark Rovera's red car. Bob quickly recognised the excellence of craftsmanship and realised there was potential for the Hilliers to go far beyond the 'burnout and boofhead' traditional car show scene. He figured the boys could benefit from his marketing and management experience. "I saw what they were doing and I decided I'd like to help them," Bob stated. "They had all the right ideas, their hearts were in the right place, they just needed that final lustre, I guess you could say." The symbiotic relationship deal was sealed when the Hilliers visited AutoTek in mid-2001. The plan was the Hilliers would complete the body and mechanicals of the car before delivering it to AutoTek's Sydney office for trimming. In this manner, the Arrow would receive a classy interior reflecting its status as a top-end, hand-crafted coupe and Roman AutoTek would have a vehicle for displaying the latest in its seating technology and trimming prowess. The Hillers took the car to Sydney around Christmas 2001. AutoTek saw the Arrow as a great opportunity to showcase its new modular Recaro/AutoTek seat concept, where OE seats are totally rebuilt using Recaro components. In this way, full government safety compliance is met for mounts and floor-pan attachment. The steering wheel is a Momo airbag unit - complete with hub-mounted controls - and the gear knob is a Momo Shadow. All is trimmed in classy Canadian leather that doesn't scream or yell - in fact, it's more restrained than the Arrow's exterior theme and whispers 'high tech carbonfibre'. AutoTek also supplied the 18x8.5 and 19x10 Speedline Type 2210 two-piece alloy wheels. The dashboard the Hilliers fitted to the car is from an upper-spec Fairmont although instead of the factory faux wood grain insert, the Arrow features a paint-splattered section reflecting the outside paint scheme. There's also an Arrow graphic on the instrument faces. 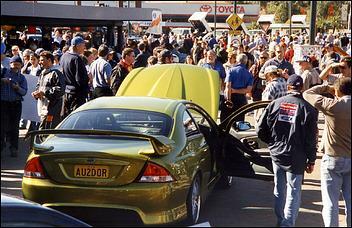 Since its competition and debut at the Melbourne Motor Show in March 2002 the car has been displayed all over the East Coast of Australia. It's stirred up the passions of Ford enthusiasts and has resulted in its aim of securing several orders for customer cars, to be based on the new BA Falcon. Maybe the old saying can be changed: If you want something done - find someone who can!